A major firm in Sydney’s west is looking at expanding it’s office space with the addition of a new wing having a total area of 1,000m2. Office hours are 9am to 6pm weekdays. The ‘LoadSmart Business Plan’ offers electricity at rates of 24.97c/kWh, 13.42c/kWh and 7.26c/kWh for peak (2pm-8pm), shoulder (7am-2pm and 8pm-10pm) and off-peak (all other times), respectively. A peak capacity charge of 12.5c/kW/day is also applicable. A chilled beam system is installed with a supply/return temperature of 14°C/17°C. The maximum daily and overnight ambient temperatures are 43°C and 15°C, respectively. Select a suitable water-chiller and PCM required and estimate the associated power/cost savings by implementing a HETAC thermal storage system. ** Nominal conditions assume Water Outlet Temperature (WOT) = 7°C and Ambient Temperature (AT) = 32°C. The best choice would be to use PC14 as the temperature leaving the PCM storage tank will closely match the chilled beam supply temperature of 14°C. 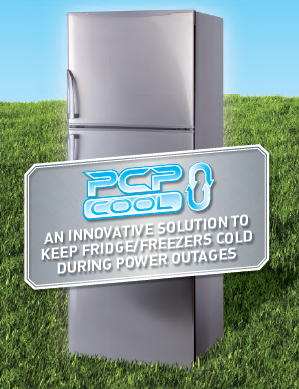 PC14 has a latent heat of fusion of 145kJ/kg and an onset melting temperature of around 10°C. This simple example illustrates that a cost saving >77% and energy saving >50% is achievable by implementing a HETAC thermal storage system. Further cost savings >82% and energy savings >93% can be achieved by implementing a HETAC thermal storage system solely during peak times to ‘Beat-the-Peak’ when energy costs are at their highest.